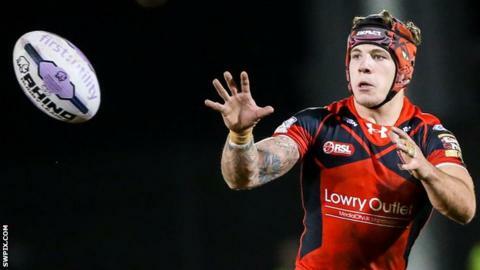 St Helens have signed Salford half-back Theo Fages for an undisclosed fee on a four-year contract from 2016. The 21-year-old had a transfer request rejected in June and was told he would only be sold for a world record fee. Two months later the France international resigned from the club for an alleged breach of contract, and on Monday he was released by Salford. "Theo is a super player and I am really pleased to add him to our squad," said Saints head coach Keiron Cunningham. "He's talented, can play in a number of positions but is also young and keen to learn." After agreeing his release along with three other players this week, Salford said they had received an 'undisclosed transfer fee' for Fages. The scrum-half joined the Red Devils aged 16 and progressed through the age groups before making his debut in 2013. "The decision has been made in the interests of moving this matter on and the club send its best wishes to the player for the future," Salford director of rugby Tim Sheens told the club website.